– Deterministic: Minimal or no random elements allowed, if the player chooses to “execute XYZ” it succeeds as expected. There are no percent to-hit or miss chances. Chess is the best example. These games have a lot of planning and quick execution. They can also become “solvable” where the best, most rewarding play can be absolutely decided because there is no random chance. The better player will always win. That Hackers game I was working on is the closest personal example I have. – Random: There are random elements in the game. Normally categorized as “input randomness” (drawing from a deck of cards, having a generated terrain setup, etc.) that players see, accept, and have to deal with. And “output randomness” like dice rolls to succeed that players have little to no control over. Sometimes this means a worse player will win. A lot of people in the Deterministic camp will accept Input Randomness (normally for replayability and variety) but scour and scoff at Output Randomness. So that’s the one I wanted to talk about. What it boils down to is you either like rolling dice in a game, or you don’t. And like I said this topic has been talked to death, so I won’t talk too much about either approach. Instead I want to highlight and interesting thought I had today: I don’t hugely like output randomness in video games, but I adore it in tabletop games. But why? This entire section will be dedicated to answering that, so don’t construe it as anything else. The easiest way to tackle this question is to look at video games first. 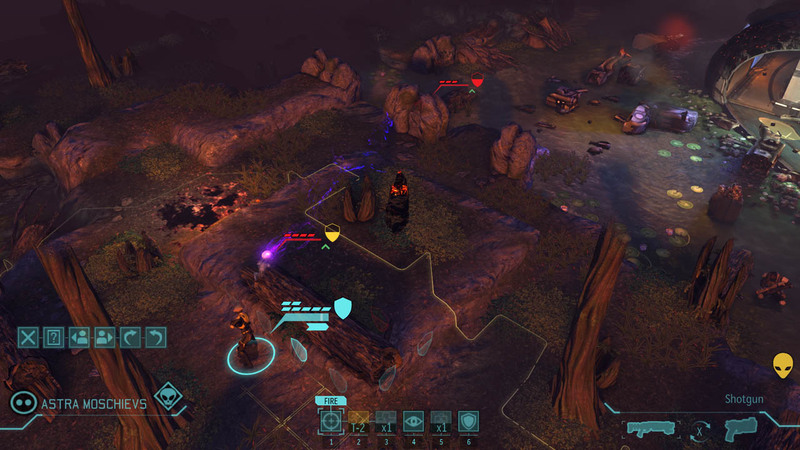 The modern X-COM remake is a good example of output randomness that can be frustrating. In that game you have a percent chance to hit the target you’re firing at. The chance varies based on soldier skill, weapon, range, and enemy cover. All that is calculated and abstracted and you see the percent chance before you shoot, click the mouse and a little animation plays showing whether you hit and did damage or not. Maybe your soldier has an audio file that plays when you miss, as you sit alone in your quiet office. Ever miss in that game with a 90% hit chance? How did that make you feel? Frustrated and like it was out of your control? Now let’s look at a tabletop example, of course using Dinosaur Cowboys. You physically pick up your hand painted miniature, move into Short Distance to hit easier, and try to improve your odds further by choosing to shoot an enemy who hasn’t moved yet. You ask your opponent across the table what their Defense is, add that to your Ranged Target Number, factor in a few mods, and figure out what you need to hit. Let’s say 9+. The chance to hit feels a bit abstract, but at least you know how you arrived at it. In terms of a percent chance you know you have a 4/12 chance per dice…but your Six-Shooter has 4 attacks, so you’re rolling 4 dice. Hmm remember your math class on probabilities? 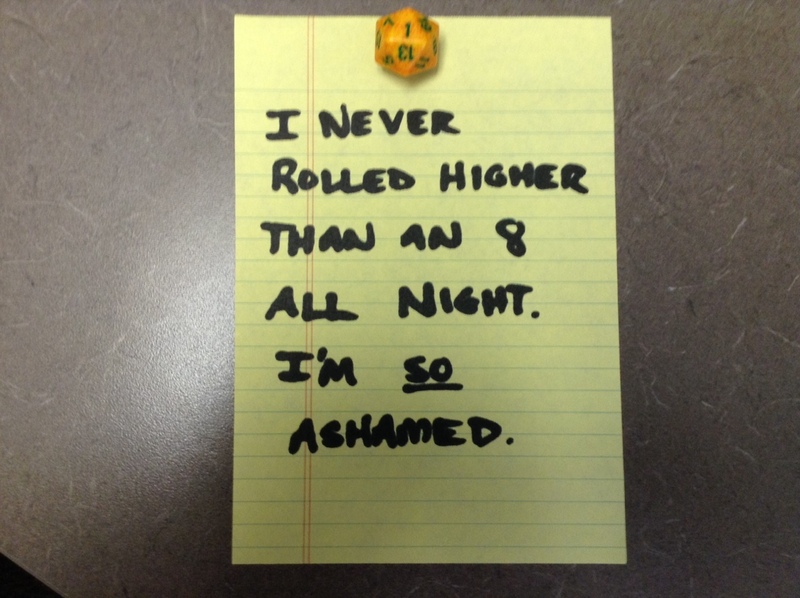 Silently hope to not roll any 1s, in fact a full roll of 12s would be perfect. You pick up the dice, get a nice tactile feel from their edges, shake them in your clenched fist. 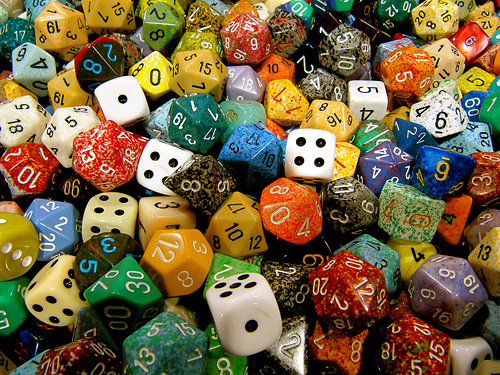 The pleasing sound of clattering dice fills your games room. Both you and your opponent are staring, waiting for the roll. The dice tumble, building anticipation. 1, 5, 9, and 12. Your eyes see the 9 and 12 first and your cheer a bit. Your opponent sees the 1 and 5 and also cheers. A hit and a Crit! But also a Reload! You curse the dice that rolled a 1, consider putting it back in your bag and getting a different one. Those examples were a bit embellished, but they hopefully highlight my point. And that is dice and randomness in tabletop games are not just about cold numbers, chances to hit, and reflecting player skill. They’re about a tactile element, and that impossible human nature feat of thinking we can control the outcome of falling plastic if we really believe hard enough. Also depending on the system the randomness covers a lot more than just hitting the enemy, such as above with running out of ammo for a Reload and the excitement and bonus damage of a Critical Hit. Somehow it’s less frustrating in a tabletop game to miss a shot with a 90% hit chance when it turns into a talking point or good story with your opponent. Miss that kind of shot 5 times in X-COM and you’ll probably take a frustrated break for the night. Have it happen in a tabletop game and you’ll be laughing while gnashing your teeth and bantering with your friends. A lot of the deterministic vs random discussions don’t account for this. And a lot of the randomness DOESN’T translate well to computer games because of all the positive elements surrounding dice on the tabletop. 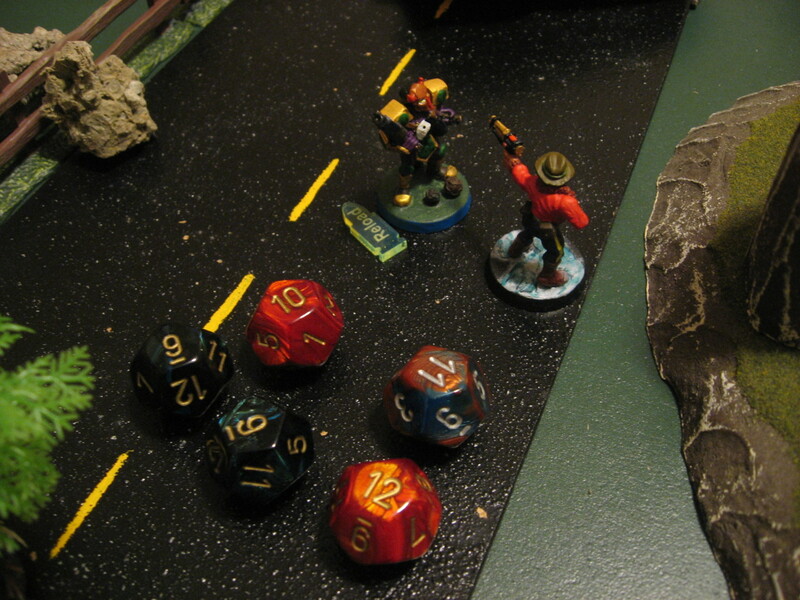 Not just computer games, but even online software for playing tabletop games virtually, like Roll20. Seeing a virtual result of 12 isn’t the same as the whole ritual and process of rolling a 12 on a physical dice in the real world. Or boiling down a fun and unique dice system with multiple side effects into a single dry percent chance resulting in “hit” or “miss”. Do dice objectively make for a worse game (don’t get me started on “game” vs “toy”)? Or do they represent everything a computer game can’t capture, and the tactile elements we keep coming back to boardgames and wargames for? While it does sometimes make for a worse determination of player system knowledge (not really “skill”), is that the be-all-end-all measurement for every game? Does anyone talk about their crazy 7 Wonders or Puerto Rico win where they added up a bunch of points in a deterministic system? “Dang I really built that Market and figured out the Science combo!” Or do gaming friends talk about that time Peter rolled six 1s in a row, then came through with a Critical Hit at a key moment?